Eggs and gravy. French fries and gravy. Steak and gravy. 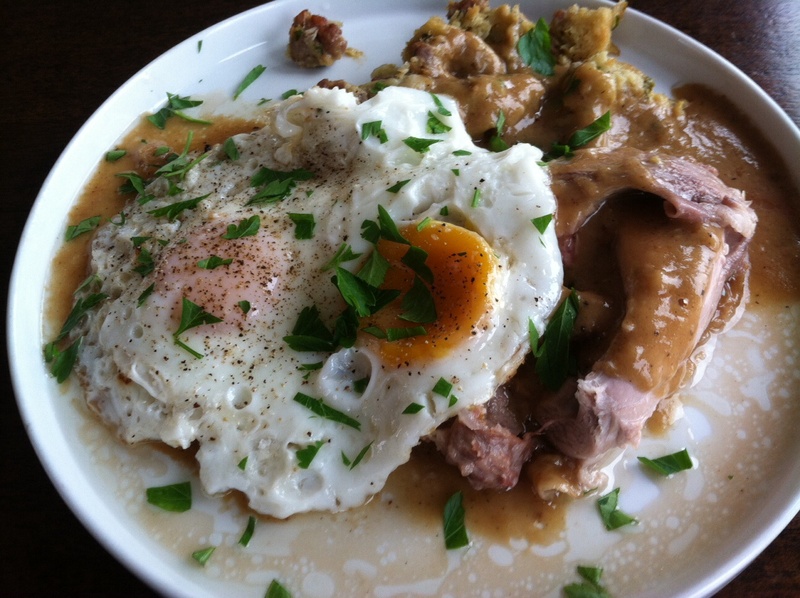 This is why I look forward to Thanksgiving: leftover gravy. I learned the art of gravy making from my grandmother. On Thanksgiving day, she’d be up at the crack of dawn making stuffing for the turkey. We woke to the aroma of sautéing onions and parsley. After the bird came out of the oven, she deglazed the roasting pan and stood over an electric skillet, stirring and stirring with an old-fashioned whisk until the gravy was just the way she liked it. There’s only one measurement you need to know: equal parts fat and flour to make the gravy roux. I don’t even measure any more. The gravy actually starts earlier in the day when I make a stock with the turkey neck and gizzards, the usual aromatics, simmering on the stove top while the turkey roasts in the oven. When the turkey’s done, it moves to a sheet pan to rest. I use some of my stock to deglaze the roasting pan, scraping all the brown bits off the bottom and stirring over heat to dissolve. Then pour everything into a separator. The fat will rest at the bottom. Pour the fat (or about 1/3 cup) into a pan over moderate heat. Add an equal amount of flour, or enough to make a fairly thick slurry and cook for a couple of minutes, stirring. When the roux starts to bubble, slowly add the dark liquid from the roasting pan, continuing to stir, and ladle in prepared stock until the gravy coats a spoon. It may be thinner than you think is right, but it will continue to thicken after you take it off the stove. To finish the gravy, add a generous drizzle of heavy cream and a snort of Marsala or other fortified wine. Even a bit of red vermouth will work. Season with salt and pepper. With any luck, you’ll have gravy for days to come. That was darn good gravy. I know. I ate it. Still savoring your liver pate, Jim.